CONCORD, NC – The 2,000-square-foot Gallery hummed with cheerful greetings, contemplative conversation and some hilarity last Sunday as collage-gluing, mark-making and paint-throwing got underway. A backdrop of original, electronic beats music soon filled the space, and the audience settled into rows of chairs to watch an unusual event unfold: the synchronous, live-painting of a huge work of art by multiple artists. 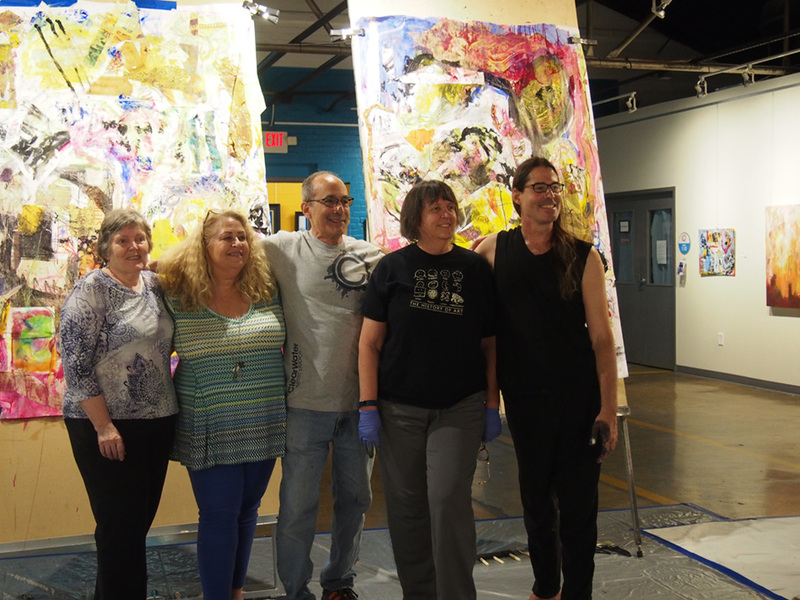 Four regional members of the Global Art Project, or ‘GAP,’ an international collaborative-artists organization, and one non-affiliated artist converged on ClearWater Artist Studios and spent three hours working together to create large, colorful mixed-media artworks on the Studios’ “Giant Easels.” An appreciative and diverse audience, ages one to 80 watched, munched on refreshments, and took in the surrounding exhibition. It was the Opening Reception/ Live Painting Demo for “Visual Strategies: A Collaborative Project,” the brainchild of local artist, Mikel Frank. Frank, former Event Coordinator and Stage Manager for the Metropolitan Museum of Art in New York (for 29 years), and artist Carl Heyward, who founded & coordinates GAP and lives on the West Coast, collaborated with Sarah Gay, the Manager of ClearWater Artist Studios, to realize an exhibition plus a series of events. The exhibit, on view through August 24, showcases international collaborative artworks. The three events introduce live collaborative painting to the public, with the third inviting families to come in and paint with Mikel. All hosted at ClearWater, which houses the working studios of 14 artists as well as the Southern Piedmont Woodturner’s Association in an old, former water and utilities plant in the Gibson Village Neighborhood. Gibson Village was originally built for mill workers in the heyday of Concord’s textile industry, and is one of Concord’s most diverse neighborhoods, near the Historic Downtown. Participating members shipped their collaboratively constructed artworks in from all over the world for the exhibit. GAP promotes the use of ‘frags,’ or fragments, which artists in the group send to each other through the mail to incorporate into larger artworks. Most are abstract. They are glued, sewn, painted, drawn, etc. The artworks hail from Spain, the UK, Belgium, The Netherlands and Japan, as well as the USA. Two videos are in the exhibition; one, a dance sequence of five dancers in Italy, shot in slow-motion against various street-art backdrops, choreographed by Macha Melanie; the other, a video exploring the spaces between relationships by Christopher Padgett Hunnicutt, one of the artists who came Sunday, from Raleigh, NC. The other artists participating in the live collaboration were Nancy Perry, from Anderson, SC; Sandee Johnson, from Asheville, NC; and Claire Schauseil as well as Mikel Frank, from Charlotte – and, Frank’s 5-year old Grand Nephew, Liam Borges, from York, SC. “What a joy it is to connect in this open space between autonomy and communion; a heart-felt and ecstatic collaboration!” he said. The artist was variously up on a ladder, spattering paint in improvisational expression, and helping glue in paper cut-up collage fragments from the others. He works as a full time artist in Raleigh with his sweetheart, Jenny Jensen, who contributed her photography. Christopher’s family was also present; his parents came to the event, as well as his son, Henry Hunnicutt, who “stood in” as Audio-Visual Manager, facilitating the digital music—which was composed by Dylan Frank (son of Mikel), aka. 'daedaepivot,’ who co-produces the music of Chicago rapper, Saba. Audience members from the local community – many in the space for the first time—made appreciative comments, saying they were glad to know a community facility like this exists here in their town. Roughly 55 people attended the event. Heyward, and another 150 FaceBook friends and GAP artists supported monitored the live video feed that Frank had running via FaceBook, shared posts, and made supportive comments (“Smash them Frag Particles!” from Heyward). On Saturday, July 14th, Mikel Frank and longtime collaborative painting partner, Gerard Amsellem, who together form the Visual Passion Duo (www.visualpassion.net), will present a 5-hour, Live Collaborative Painting Demo, accompanied by live music with local jazz pianist, Noel Freidline. The Duo has performed with Ethel contemporary classical quartet. Then, on Saturday, August 11 the Studios will host the 3rd and final event, Family Collaborative Painting Day; Sessions at 11am and 2pm will be facilitated by Mikel Frank (until 4pm). The community is invited to come paint a large work together, facilitated by Frank, which will then be added to the exhibition. Doors open at 10am for 2nd Saturday Open Studios. Details are at www.ClearWaterArtists.com. See http://chamazone.wixsite.com/globalartproject for more on the Global Art Project. ClearWater Artist Studios wishes to acknowledge and thank Charlotte-area store, Binders Art Supplies (located in the Cotswold area of Charlotte), for their generous donation of paints and painting medium used for the event (and for those to come). ClearWater Artist Studios is located in Gibson Village, less than a mile from Downtown Concord, 223 Crowell Drive NW. Its Gallery is open to the public most weekdays, Noon-5pm; every 2nd Saturday10am-4pm; and/or by appointment. The Gallery, outdoor Green, and open-air covered Market are available to rent for private events. For details, see clearwaterartists.com; or call 704-784-9535.